The Pyrus puzzle consists of four tetrahedra and one octahedron, and they can be stacked together to form one larger tetrahedron. 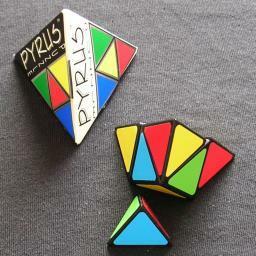 The triangular sides of the pieces are each coloured with one of the colours red, green, yellow or blue. The aim is to assemble them as a larger tetrahedron in such a way that each side shows all four colours. The basic idea of this puzzle is reminiscent of the Instant Insanity puzzles. It was made by the same company that made Pyrix, namely Enpros Novelty Products, so the pieces and the packaging are of identical construction. Below are diagrams of the 16 solutions. The first four solutions are clearly distinct. The second four solutions are similar to the first four, only reflected and with blue and green exchanged. Similarly the second eight solutions are the similar to the first eight, only reflected and with red and yellow exchanged.